The outcome of the 24 September German elections was dramatic itself. The Christian Democratic Union/Christian Social Union’s (CDU/CSU’s) 33 per cent was its lowest per centage of the vote since the first election in West Germany in 1949. The German Social Democratic Party (SPD) result was even worse – at 20.5 per cent it was the lowest vote ever recorded by the SPD in any election in West Germany or the reunited Germany. The extreme rightest Alliance for Germany (AfD) received 13.5 per cent of the vote – the highest for an extreme rightest party in Germany since World War II. The radical left Left Party received 9.2 per cent of the vote. The increasing fragmentation of German politics was seen in seven parties entering the German parliament by receiving more than five per cent of the vote – complicating the question of how to form a government. But the German election result also strongly confirms a more general political trend – the great weakening of the Western political ‘centre’ under the impact of the prolonged economic stagnation in the Western economies since the international financial crisis. 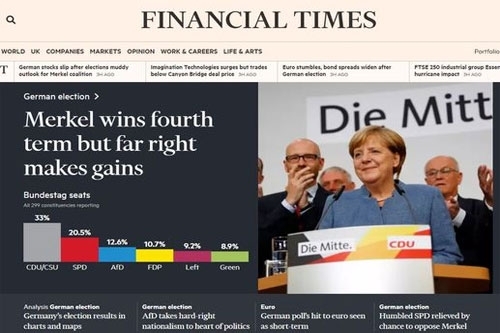 · In 2012 Marine Le Pen’s National Front achieved an electoral breakthrough in France which began the rise of ‘populist’ movements in advanced countries of which the AfD’s success in Germany is the latest example. · In September 2015 radical left winger Jeremy Corbyn was elected leader of the UK Labour Party, and in 2016 easily defeated an attempt to replace him. In June 2016 the UK voted in a referendum for Brexit, also leading to the resignation of prime minister David Cameron. In June 2017 the Conservative Party lost its majority in parliament in a general election which saw a strong increase in the vote for Corbyn’s Labour. · In November 2016 Trump was elected US President against the wishes of the establishment of both Republican and Democratic Parties. This followed a Democratic Party Presidential candidate primary campaign during which Bernie Sanders became the first openly proclaimed socialist in the US to achieve mass popular support for almost a century. Opinion polls since then have found Sanders to be the most popular US politician, with 54 per cent of voters viewing him favourably, and 36 per cent per cent unfavourably – the only US politician to have a net positive approval rating. Following Trump’s inauguration as President in January 2017 almost continual severe political clashes in US politics have taken place with numerous Congressional investigations, clear attempts by powerful sections of the mass media (CNN, New York Times etc) to remove the President, and Trump’s approval ratings falling more rapidly than any other US President. · In May 2017 Macron was elected French President against the opposition of both right and left wing traditional political parties and he then proceeded to defeat by a large majority the traditional French parties in the legislative elections. However, only months after his election, Macron’s popularity was falling even more rapidly than his Socialist Party predecessor Hollande. On the same day as the election to the German parliament Macron’s party won only 8 per cent of the seats in the elections to the upper house of the French Parliament. Therefore, it is clear that the result of the new German election is only part of the increasing political turbulence and continuing weakening of the political centre in the Western countries. The reasons for this weakening of the Western political centre is clear. Western economic growth is now actually slower than in the Great Depression after 1929 and, even according to the projections of the IMF, a pillar of Western economic orthodoxy, this trend will continue. The inevitable result is slowly deepening political instability in the West. It is important to have a precise sense of proportion. Only in the ‘Anglo-Saxon’ countries, the US and UK, has this political instability reached the point where figures opposed by the dominant economic and political elites have come to office or their policies been adopted – Trump in the US and Brexit in the UK. In continental Europe the ‘centre’ forces, while significantly weakened by challenges from the right and left, have nevertheless managed to retain power so far. In France, while Macron crushed the traditional political parties in the presidential election, his pro-EU policies were not opposed by the traditional French political elite. In Germany, while the political centre was eroded, Merkel will remain Chancellor. In Britain while the Conservatives lost their majority in Parliament, and Corbyn’s Labour enjoyed a powerful increase in votes, Theresa May continued to hold onto the prime ministership of a minority government. However, while there will be a limited Western economic upturn this year, there is no perspective, either from fundamental economic analysis or even according to IMF predictions, of a major medium-term upturn in the Western economies. Therefore, political instability and erosion of the political centre in the Western countries will continue and deepen. In addition to the implications for citizens of Western countries themselves this is also clearly a development China must be aware of and take into account in its foreign policy. In previous periods of the existence of the People’s Republic of China, both during the Mao Zedong dominated phase from 1949-78, or during the Deng Xiaoping inaugurated reform period from 1978 up to the international financial crisis of 2008, China confronted Western economies which were growing relatively rapidly. This therefore was reflected politically in dominance by ‘centre’ political forces in the West. But the ‘Great Stagnation’ since the international financial crisis, the ‘new mediocre’ to use the phrase of IMF Managing Director Christine Lagarde, means a weakening of Western ‘centre’ political forces of which the German election is the latest example. This new situation of slow growth in the Western economies since the international financial crisis is therefore accompanied by significant and so far deepening shifts in the configuration of political forces in Western countries.